The Malta Darts Association was founded on 14th March 1962 with the first ever president Mr. Benny Pace leading the association for a staggering 35 years, with a 2 year break between 1978-1979. 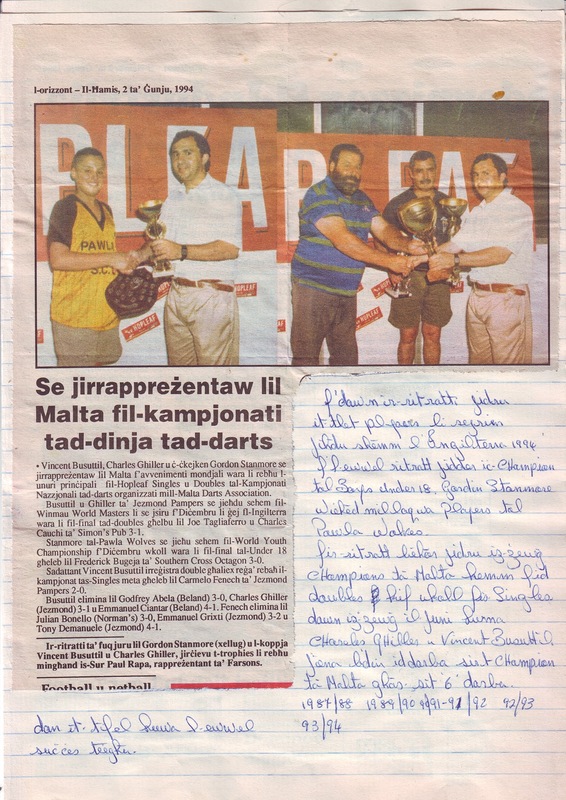 A magazine carrying the name “Morning Star” used to be published by Mr. Pace himself which at the time was also the name the association carried which by time changed to Malta Darts Association as its known today. 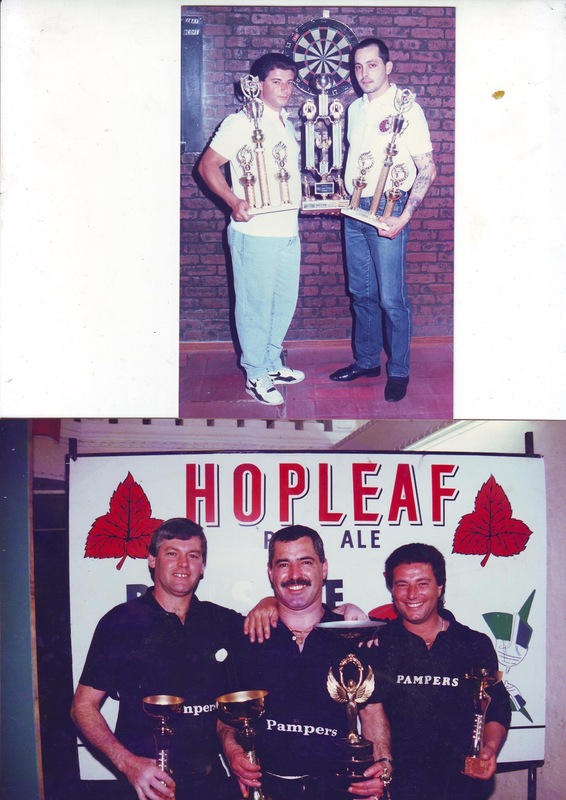 The first ever committee was composed of Mr. Benny Pace as President, Mr. Louis Florian as General Secretary, Mr. Peter Tonna as Treasurer and Mr. David Manduca & the Bongailas brothers as committee members. 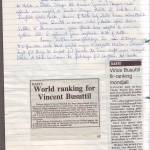 Q: When was the first playing experience abroad for Maltese players? And who took part? The first experience was at the World Cup in 1976 which took place in London, England. This event which was organised by Unicorn saw the Maltese contingent finishing in fifth place. Representing Malta were Grezzju Scicluna, Francis Cikku Mifsud, George Borg and Felix Buhagiar. Scicluna and Mifsud made it all the way to the quarter final where they were eventually eliminated by Canada 3-2 with Borg and Buhagiar finishing in seventh place. 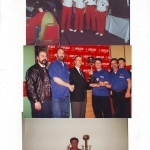 A year later the World Darts Federation was formed and the first ever “official” World Cup was held at Wembley, England. 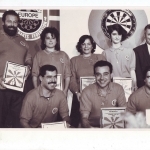 Q: In 1990 the WDF European Cup was held in Malta. What memories do you have of this event? What an event it was! It was held at the Corradino Sports Pavillion in Cospicua with various top players gracing us with their presence. Our national team was composed of Vincent Busuttil (Il-Ħassu), Charles Ghiller, Godfrey Abela and myself with reserve players Joe Zammit and Mario Tonna. In the team event, Malta was eliminated by the Republic of Ireland 9-6 in a match we lead 6-3. 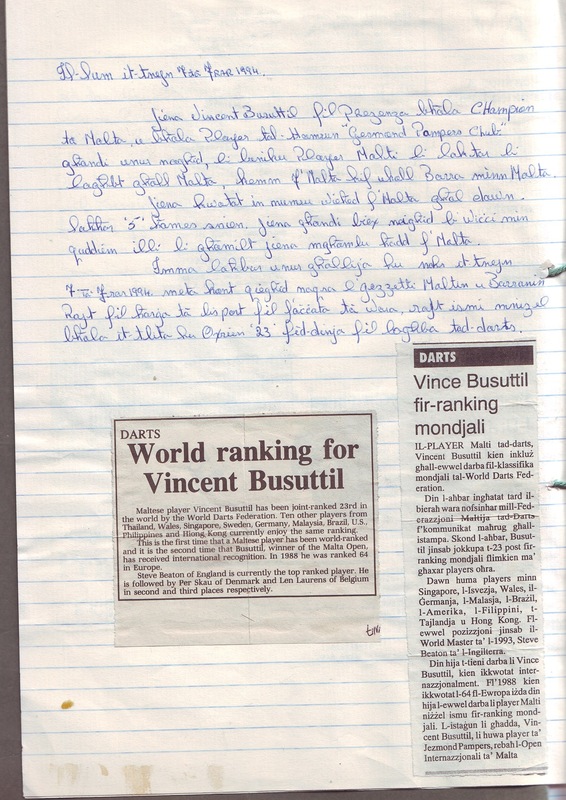 In the pairs events, a match that stood out for me was when Maltese pair Busuttil/Ghiller faced two of the all time best, Eric Bristow and John Lowe. The Maltese players performed exceptionally well on the day and managed to force a decider with a couple of darts missed at the double to which the English pair took advantage off to win the tie 4-3. 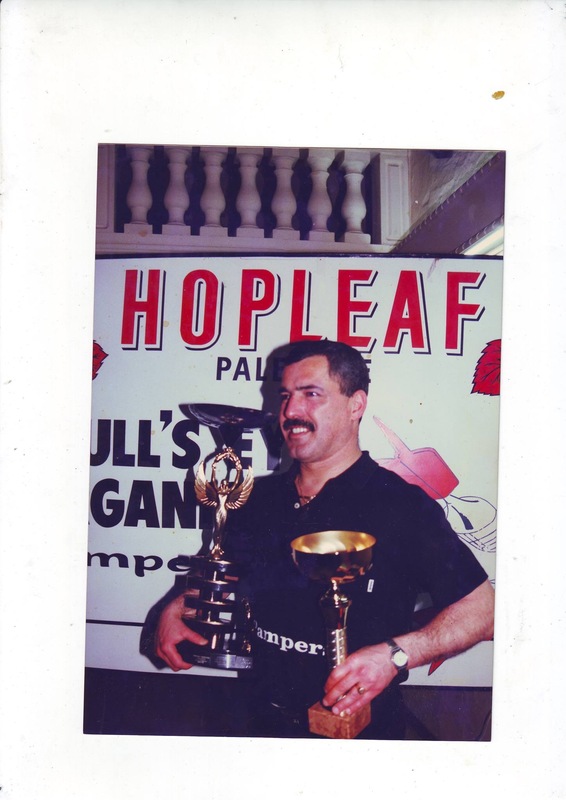 Abela and I were drawn against possibly the best player of all time, Phil Taylor and his partner Bob Anderson. A 4-0 win for the English pair with one of the legs won in 10 darts (Taylor 180, Anderson 180, Taylor 109 to leave 32). 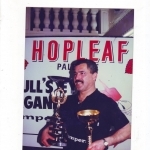 England on this occasion dominated as they completed a clean sweep with all 3-titles won by them (Team, Pairs and Singles) with the singles title going to Mr. Phil Taylor who during these championship hit a staggering 57, 180s !!! 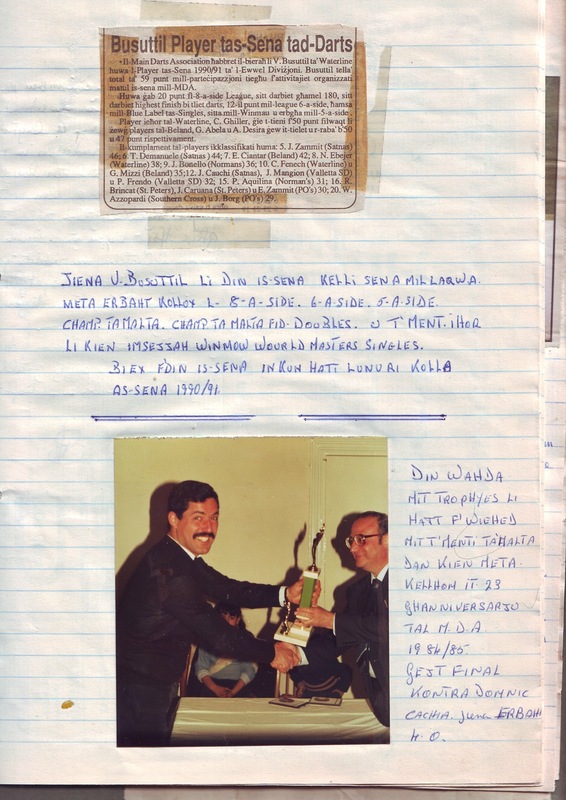 Q: How and who created the Malta International Open? 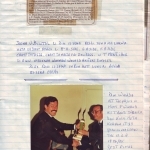 This was created back in the 70s as a number of Maltese players used to travel to England to play various darts competitions with great performances and results achieved and on one particular occasion a gentleman by the name of Mr. Alan Fraskia spotted their talent and got in touch with the Maltese committee at the time to organise an international event here in Malta with the agreement that he would bring various British players with him to this event. 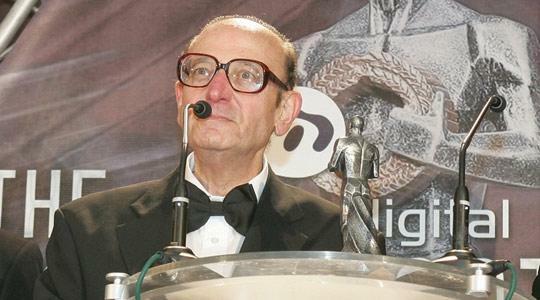 Mr. Fraskia himself was the main person responsible for the organisation of this competition as well. 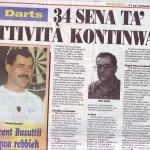 At the time this event did not carry ranking points as that was introduced in 1986. 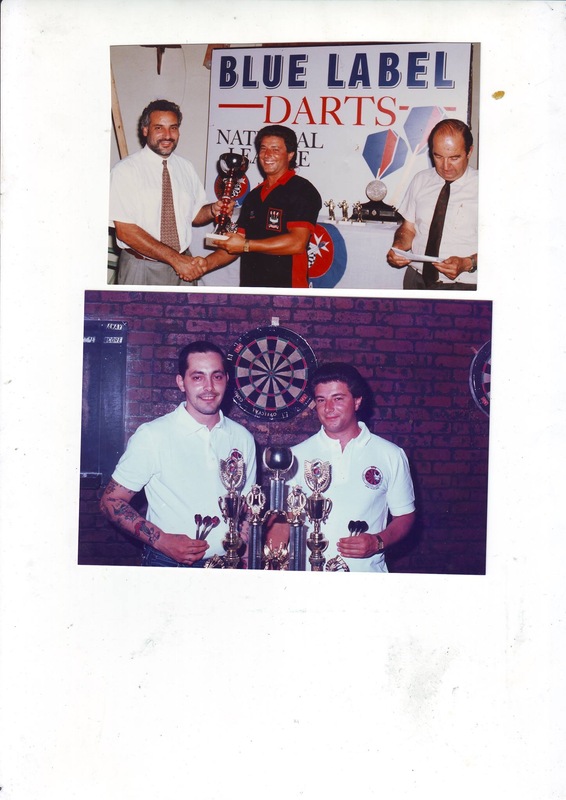 Q: What memorable moments do you cherries and are still talked about by the darts enthusiasts here in Malta? Wow, so many moments but for me the best memories are when top players used to come to Malta to player against local players. The three names that stand out for me were Leyton Rees, Jocky Wilson and Cliff Lazarenko. To point out as well that all three were defeated by local players … Rees by Frankie Bonnici, Wilson by Charles Ghiller and Lazarenko by yours truly. 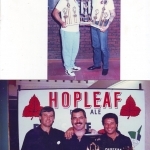 Q: How were the national teams performances in the past during WDF World Cup / European Cup and Mediterranean Cup? 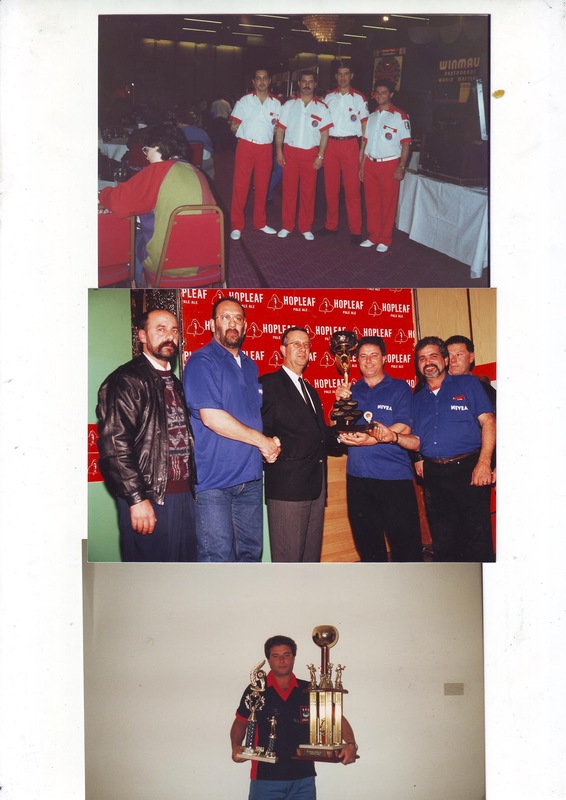 During all editions of the Med Cup the Maltese team performed well with the best moment coming in 2003 when the team was crowned champions in Cyprus.Vincent Busuttil and Mario Camilleri won the pairs competition with the later also reaching the final in the singles event. Three medals (2 silver and 1 bronze) during the 2017 edition in France is also quite a feat for our tiny island. At the European Cup the best performance came in 2016 which was held in Egmond Aan Zee, Holland which saw the Maltese team topping their group with wins over Luxembourg, Iceland and Germany. At the last 16 stage a brave performance by the Maltese team was not enough to defeat a strong Scottish team. In the singles event, Norbert Attard progressed all the way to the semi-final eliminating 2015 World Champion, Scott Mitchell and number 1 ranked WDF player, Darius Labanauskas along the way to claim bronze medal as he was defeated by home favourite and gold medal winner Richard Veenstra. At the World Cup unfortunately not to many moments to share due to the lack of participation in this event, mainly because of the costs attached especially when the competition is held outside of Europe. Q: Anything else that you would like to mention? 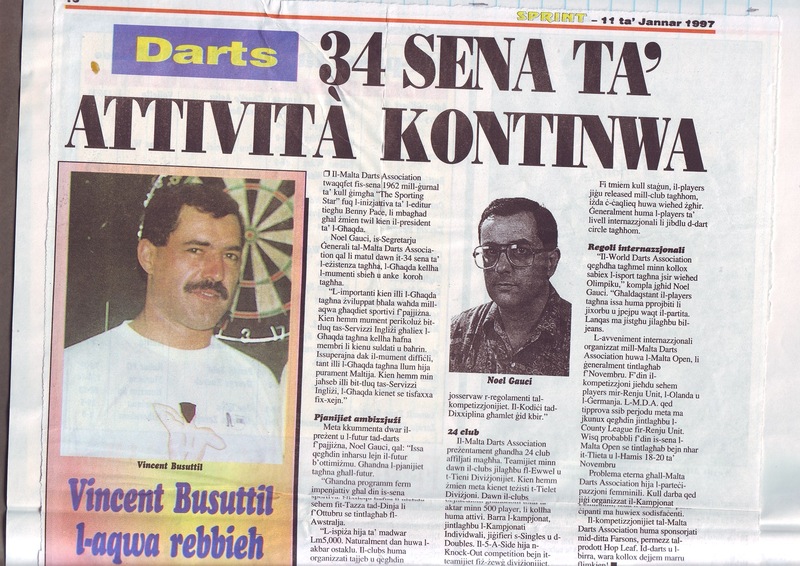 Yes, a mention has to certainly go to Vincent Busuttil who not a lot of people know that he held the 24th spot in the World Darts Rankings in 1994.